The NHS in England could save more than £300m a year by being more efficient when prescribing drugs, the government spending watchdog says. GPs could make more use of cheaper, non-brand versions of the most common prescription drugs, without harming care, the National Audit Office said. 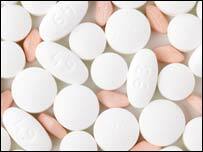 It also said at least £100m a year could be saved by reducing wastage, often caused by over-prescribing. In 2006 the NHS spent more than £8bn on medicines in primary care. That figure represents a 60% real-terms increase in the last 10 years. Does the NHS waste money on drugs? The report identified large variations between primary care trusts (PCTs) in the extent to which GPs prescribed cheaper drugs for the same conditions. The watchdog analysed PCT data on the four most common types of medicines - statins for high cholesterol, renin-angiotensin drugs for high blood pressure, proton pump inhibitors for gastric conditions and clopidogrel for blood clotting. Between them, they account for one-fifth of the entire NHS drugs bill. The report showed that more than £200m a year could be saved if all PCTs prescribed as efficiently as the top performing 25% of PCTs. If all PCTs prescribed as efficiently as the top 10% of PCTs, then more than £300m could be saved. 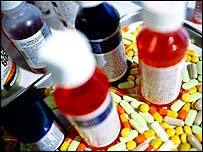 New drugs are normally covered by a patent, giving the manufacturers a chance to recover development costs. When the patent runs out, other companies can make generic versions of the branded drug which they often sell for a fraction of the price. The report said some GPs are continuing to prescribe the pricier drugs when there are cheaper alternatives. The watchdog called on PCTs to compare practices, but expressed concern about the influence of the pharmaceutical industry on GPs. The report also found that there was a significant cost to the NHS from medicines being wasted, for example, by being dispensed to patients but not used. The watchdog said the full cost of wastage is difficult to quantify because of a lack of robust data, but it estimated £100m of drugs were returned unused to the NHS. The report said that the Department of Health needed to do more work to establish a robust estimate of the scale of medicines wastage in England and why patients do not take their drugs. Sir John Bourn, of the National Audit Office, said: "There is significant scope for the NHS to improve the value for money of prescribing in primary care." But Professor Mayur Lakhani, chairman of the Royal College of General Practitioners, said: "As a practising GP, I also know that many prescriptions are started by hospitals who use a different list of approved drugs which may not represent the best value for money. "It should also be recognised that patients do not like frequent switches of drugs and many are suspicious of reasons for change, seeing it as cost cutting." He said about 83% of drugs currently prescribed by British GPs were generic, one of the highest levels in the world. Health Minister Lord Hunt said the government was putting pressure on the NHS to become more efficient in prescribing and it was beginning to have an effect. "The government recognises the importance of getting the best value for money for the NHS," he said. Who is responsible for 'wasting millions' on drugs? Is the NHS wasting money on drugs?